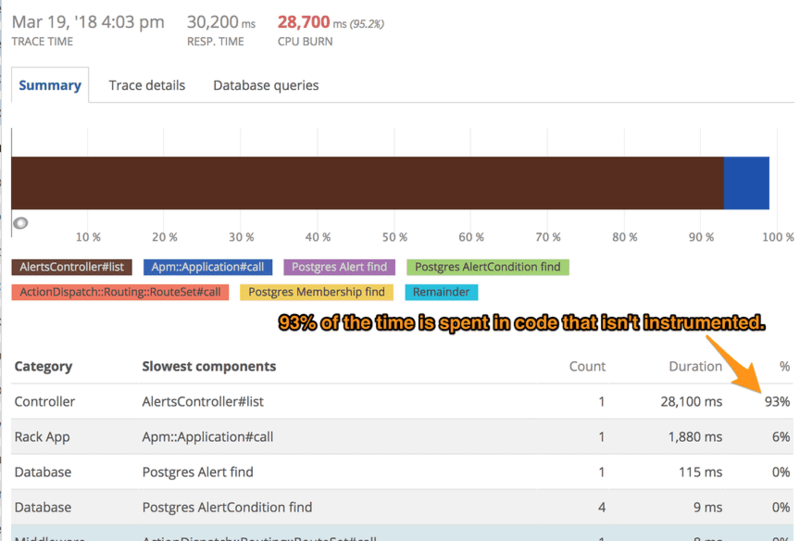 This is a guest post by Derek Haynes from Scout, an APM that integrates with Rollbar. Today, it's easier to build resilient apps, but they fail in more complex, unique, and subtle ways. These issues are time-consuming to track down. While several niche New Relic alternatives have appeared, they've focused on a lighter feature set versus solving these increasingly hard performance problems. Unlike existing "New Relic Lite" alternatives, Scout approaches performance monitoring much like Rollbar's best-of-breed error monitoring. Scout is designed to drastically reducing the investigation time for these complex performance issues. 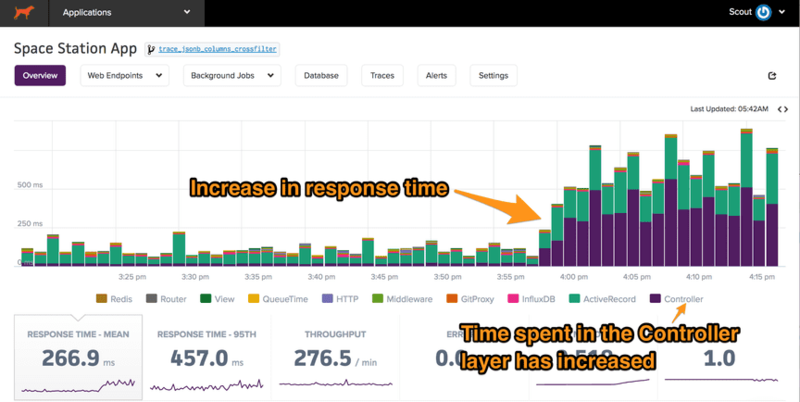 Let's investigate a modern-day performance issue with Scout and compare the experience to New Relic. Is this isolated to a single web endpoint or across the app? What area of code is responsible for this bottleneck? Which developer on our team is best equipped to fix this? Around 60 endpoints received traffic during this incident. Are response times increasing across many endpoints or just one? 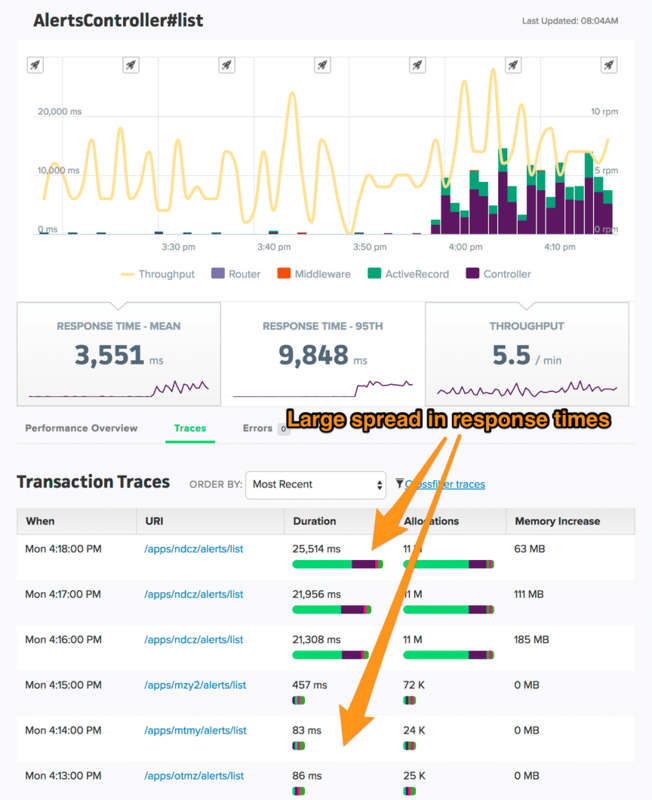 In New Relic, you'd need to navigate to the "transactions" area, click on each transaction, and identify which endpoints match the trend. This can be a laborious process. With Scout there's no need to manually click on dozens - or sometimes hundreds - of different endpoints and inspect charts. Scout analyzes the response time of each endpoint for you, identifying those with the greatest latency over the highlighted timeframe. 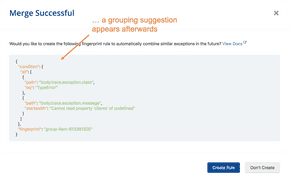 There's only one endpoint that mirrors the overall response time trend - AlertsController#list. We've dramatically reduced the time to identify the scope of the impact with Scout. This issue is limited to one endpoint. Do these very slow requests share something in common? We can see all of the slow requests are coming from the same request path and user email. We've identified the needle-in-the-haystack conditions triggering the incident. This quick inspection of trace data isn't possible with New Relic. Now that we know the triggers, what section of the code is the root cause? Almost all of the time is spent in your custom code. You could guess where to add custom instrumentation, but that's a long process with a slow feedback loop. Local profiling may not help if you don't have the ability to reproduce the production dataset. ScoutProf identified two Ruby bottlenecks. Additionally, Scout identified a database query that returned nearly 21k rows (this information isn't available in New Relic). We're almost there. Your team is composed of several developers. You aren't familiar with this code and are unlikely to be efficient at addressing this issue. It looks like we're seeing these very slow request because current_app has far more alerts than other apps. Since we're using Ruby to filter database rows, this is slow. The solution? Move the filtering conditions to the SQL query. Scout supports a growing number of languages. 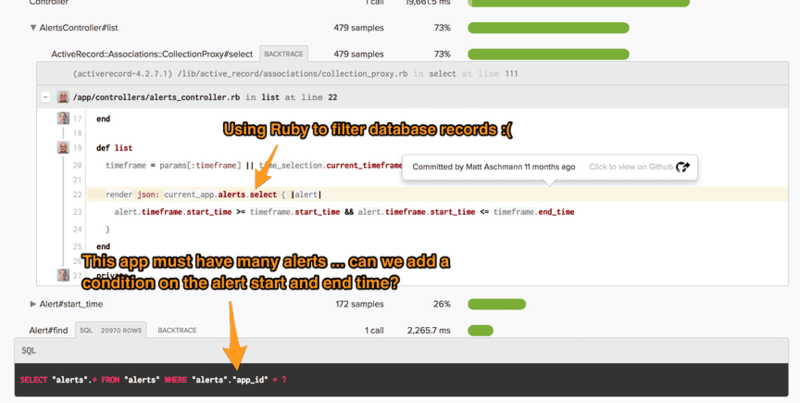 Today, Scout has performance monitoring agents for Ruby / Rails, Python, and Elixir. In most cases, Scout is more affordable than New Relic. You can easily tune the volume of data you send to Scout for analysis by sampling or ignoring some transactions. 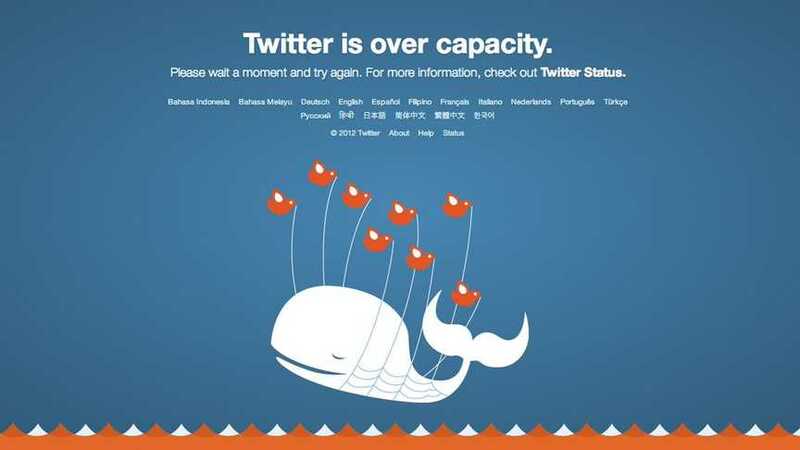 New Relic was built in the time of large-scale, major outages. Scout takes Rollbar's best-of-breed approach to today's softer, but harder to investigate performance issues.